Home » Engagement » Argyle Pink Diamond Rings » DJSP/43 18ct Rose and White Gold Argyle Pink Eternity ring. 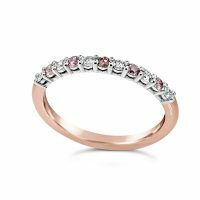 DJSP/43 18ct Rose and White Gold Argyle Pink Eternity ring. A classic claw set eternity ring set with 5P Argyle Pink round brilliant and matching Evs white diamonds in an 18ct Rose and White gold handmade setting.